So I’m noticing that the more I’m trying to cut calories with my cooking and eating, the more I’m craving that punch of heat from chili peppers and spices. That’s what makes this dish so yummy! 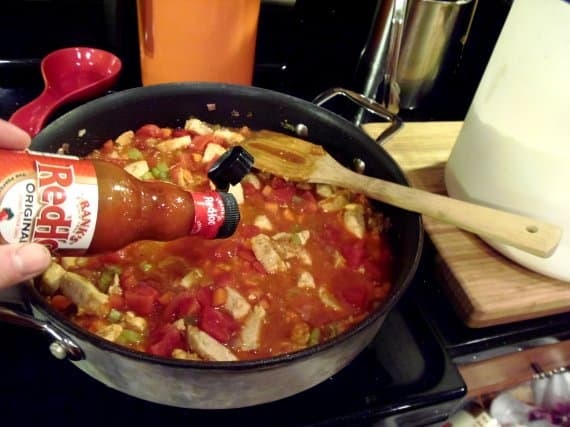 You can tailor your heat (or lack of) to your tastes by leaving that little red bottle of hot sauce of the table for anyone who appreciates a bigger hit of flavor. I did not come up with this recipe on my own. Since I’ve been trying to cut calories in my cooking, I’ve been a little shy about straying from the low-calorie recipes I’ve been finding in my cookbooks and magazines. 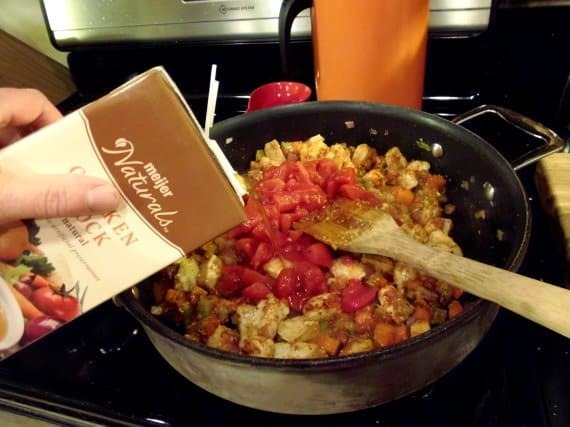 I’m walking the straight and narrow right now when it comes to ingredients (so not my usual style of cooking) until I feel comfortable enough to branch out on my own and come up with my own creative low-cal meals. This recipe was found in Marlene Koch’s cookbook called “Eat More Of What You Love”. I’ve made several recipes from this book and have enjoyed each and every one very much. Truth be told, I’m actually enjoying this new, calorie conscious, way of cooking (and eating) and as a bonus I’ve lost a few pounds in the past weeks too. There used to be a time (in my “diet” history), when I’d make the so called “normal” meals for my family and then I would then attempt to gauge my calories and meal size by using portion control and will-power to eat those smaller, healthier portions of the foods I loved. My thought process was, why should I make my family suffer along with me by me making so-called “diet dinners” that everyone had to eat? What I found was that I was sabotaging myself and that doing what I thought would make everyone happy wasn’t working for me. Try as I might, those “normal” foods were still so high in calories (even though I was making somewhat “healthy” dinners) that even a few extra bites over those smaller portions played havoc with my weight and mindset. 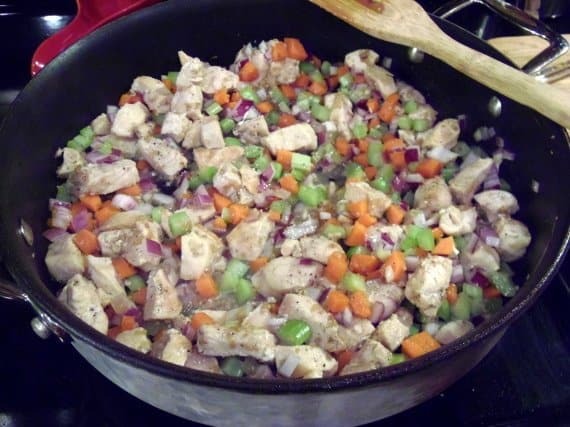 I’ve now come to realize that if I start out making a lower-calorie meal for the entire family right from the get-go, THAT is the way to go and every-body benefits. As long as the dinners are tasty and packed with flavor in the first place, then no one is suffering. Heck, they only know the foods are lower-calorie now because I tell them, not because their meals are lacking flavor… and guess what? Low and behold…everyone IS happy!!! DING! 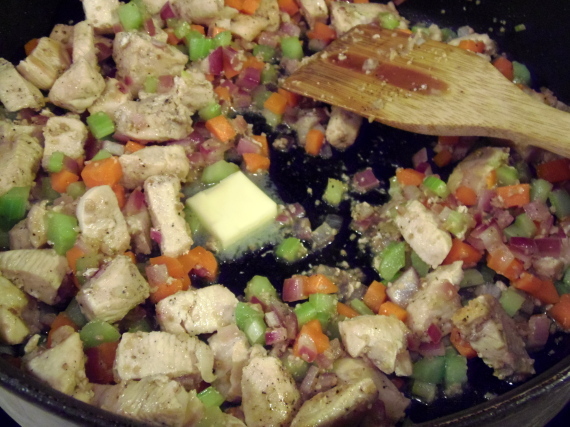 -In a large, high sided skillet, over medium high heat, saute the chicken in the oil, until almost cooked through (approximately 10 minutes). -Add in the carrots, onion, celery and garlic. Cook an additional 1-2 minutes. -Turn the heat down to medium and add in the butter and flour. Stir to combine. 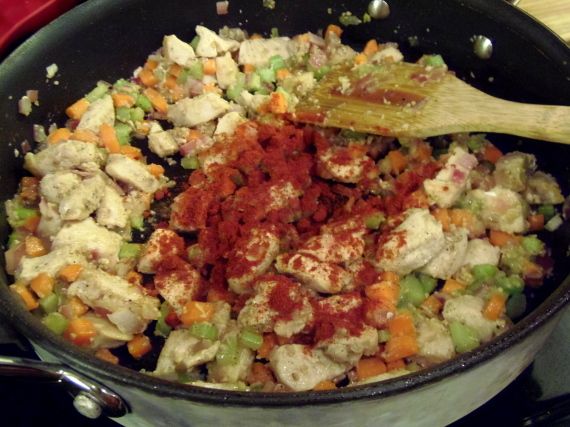 -Add in the paprika, hot sauce, canned tomatoes and chicken broth. 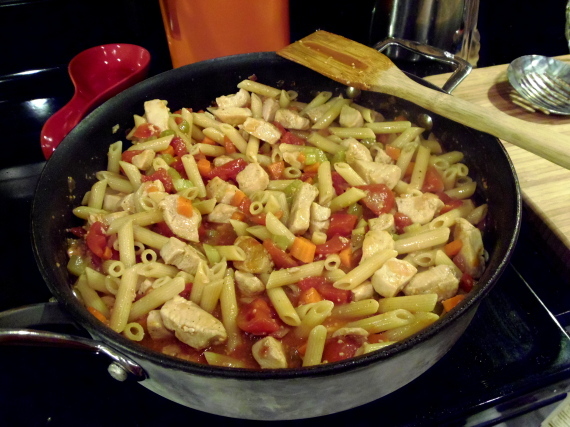 -Add in the cooked pasta and stir well to combine. 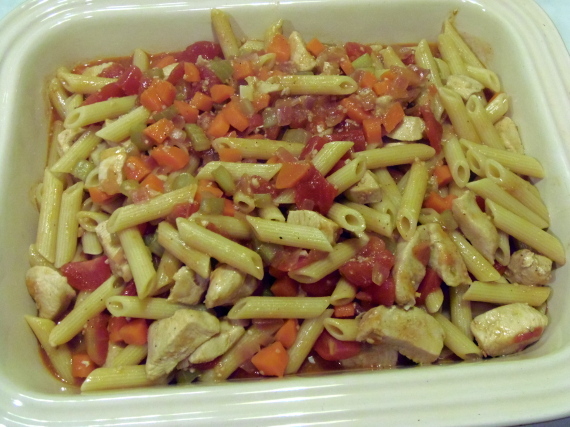 -Spoon the mixture into a 13×9 casserole dish and bake for about 10 minutes, covered. 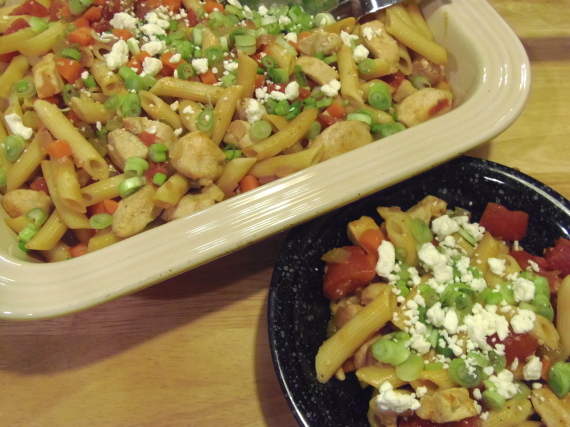 -To serve, top with the crumbled blue cheese and chopped green onions. Until we eat again, here’s to good food and good health! Thank you Paula! This dish was delicious as leftovers too. Win. Win! Delicious dish!! It's so true that when you are cutting calores or portion size and generally trying to eat more healthfully you tend to crave strong flavors, I think its a way of compensating. 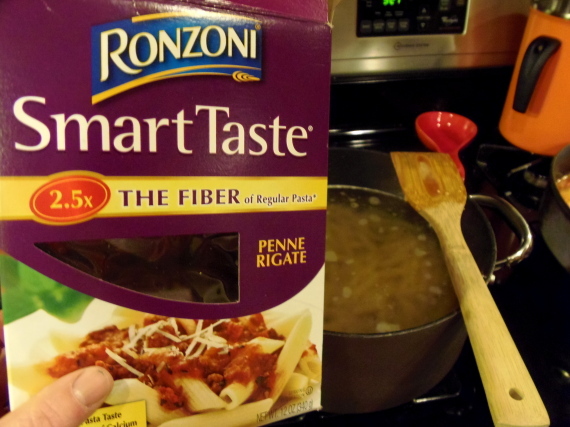 I've never tried that whole grain pasta, will have to give it a try.